Sustrans' project delivering free information, advice, resources and events to help people in Stockton walk and cycle for more of their everyday journeys. Like any commuter, you will probably need to carry stuff; papers, reports, tools, books, lunch, a gift for a co-worker, a change of clothing. The first thing to ask yourself is do you really need to carry it? Instead of carrying a laptop every day could you use a USB memory stick? Instead of carrying a lock could you leave it at work? You get the idea? The next thing to consider is how you carry your things. You can use a backpack or a ‘messenger’ type bag but this can make your back sweat and give you shoulders and neck ache. 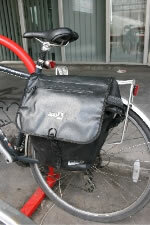 A rear carrying rack is reasonably cheap and you can fix ‘pannier bags’ to the rack. You probably need to experiment with various carrying arrangements. Whatever you decide to do make sure that all items are secured and will not fall off or affect the handling of the bike. Have a look at the commuting section of the forum for handy hints and tips.